What makes Champagne Bubble? 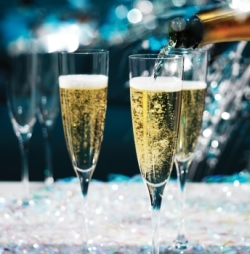 What is the Difference Between Champagne and Sparkling Wine? Ever wonder what makes champagne champagne? What makes champagne bubble? It’s wine isn’t it? Well here is another champagne fact for you. Champagnes starts its life out just like any other wine growing in the vineyards waiting on the harvest. Things begin to change in its life path as soon as the first fermentation of the wine begins. There are three processes that are used to make champagne. The first; Méthode Champenoise, is the oldest process and is used by the finest brands. It is also a law in France that if producers do not use this process they are not allowed to use the Champagne name and hence have to label it as sparkling wine or under some other distinction. As you can see, in where what makes champagne bubble – not all bubbles are created equal. There are two main methods for adding bubbles to wine; well there are actually three that are most commonly used. The third I will just mention at the end as it is not a method used for any of the champagne me, my friends or you and yours should be drinking. This is the traditional method of making sparkling wine and has been used for centuries. The first fermentation of the wine is done in the regular manor and once the winemaker decides the cuvee has reached the desired levels the wines are blended. The wine is then given a bottling dosage of special yeast and sugar and bottled. The first bottling is not what you expect as it is meant to be temporary. No corks yet, just a simple soda pop like top that will be removed later. The addition of the bottling dosage is to create a second fermentation which produces additional alcohol and adds carbon dioxide gas within the bottle… Yes, this is what makes champagne bubble. The process also produces sediment so as it does not end up in your glass the bottles are put through a process called riddling (or rémuage). By positioning bottles pointing downward at a 45° angle in special racks called pupitres the sediment begins to settle into the neck of the bottle. Every 3 or 4 days the bottles are given a slight shake and a slight turn, and placed back onto the rack, increasing the degree of angle until it is fully upside down. A process that varies in time from producer to producer, but usually takes from 6 to 8 weeks. Once the process has been completed the bottles are carefully opened and the sediment removed in a process called disgorging. After this has been accomplished the champagne is tested by the winemaker and a shipping dosage is formulated adding some of the original cuvee and sugar to add to the sweetness and then it is bottled into its final format. As the consumption of champagne rose producers kept looking for quickes ways to “McDonaldize” the process. Hence, producers started making champagne in pressurized tanks where yeast and sugar are added to the wine before bottling. Once the vintner decides that the champagne has reached the specifications they were looking for the champagne, bubbles and all is bottled and sent out or aged a while longer in the bottle. Okay I told you I would let you know about the other method sometimes used. If you like really cheap champagne then maybe you have had some created in this manor. The pump method is just like it sounds. Champagne bubbles are literally pumped into the wine at bottling much like they do when they make soda. It certainly saves time, it certainly saves money, and it certainly makes winemakers cringe, but I guess it has its place. Just not in my place! Know you understand what makes champagne bubble now lets get down to what makes champagne great…. Read more champagne facts coming soon.